As a long-time knitter my knowledge is admittedly rather extensive. However, there are still things in knitting that I have difficulty with, especially when it comes following lace knitting patterns – I keep getting frustrated and the poor lace shawl I have been working on for years winds up back in it’s basket where I simply admire the hand painted yarn that it should have been completed from several years ago. Sigh. When Kathy offered me her book, as she did with her “Knitting for Beginners” I was interested to see what she had come up with. Honestly, I am disappointed. 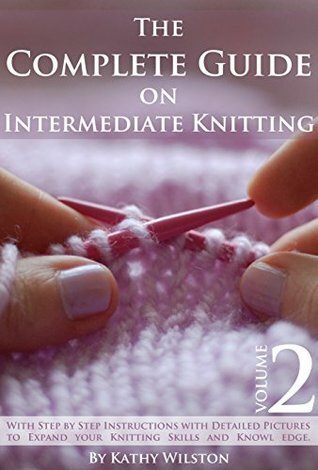 While the photos are well done, the book itself feels uncomfortably simplistic and doesn’t really offer what I would consider to be truly useful information for the “Intermediate” knitter. For example, let’s go back to my lace shawl issue. In Chapter Three – Reading Intermediate Patterns, there is a list of “Basic symbols for lace knitting” that can be found anywhere – which is OK in and of itself as all symbols are the same across the knitting world. And there is a minor (very minor) list of Abbreviations. But the “Examples of Chart Symbols” there is a very simplistic set of paragraphs, but no chart reading example at all. I would have given the book two-stars, to be honest, but there is a very extensive list of links in the back that can be quickly referenced to look things up on the net, but other than that I truly wasn’t impressed by the quality of the book. There are a lot of resources out there for the knitter who wishes to “step things up” from knit/purl scarves. I would recommend that you visit your local yarn shop, where the proprietors will be happy to help you with questions, show you how to make it through difficult concepts and point out excellent reference materials. I received this book from the author in return for a realistic review. All thoughts are my own.